Like everybody says, Bill Monroe is hard to get to know, but once you get to know him he’s really a good man … We used to get out and drive around and talk, and we’d go fox hunting together. I’d go out and sit in the woods with him at night and build a fire and we’d listen to them dogs run. I just really enjoyed working with him. Quoted by Ed Davis in “Bobby Hicks: A Living Legend Returns,” Muleskinner News, June 1975. 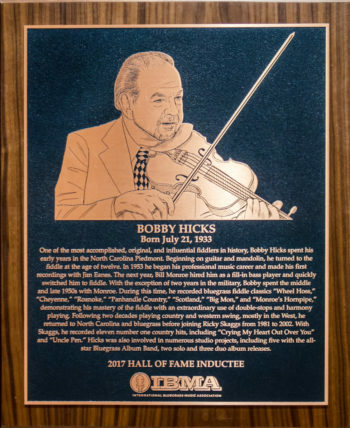 Bobby Hicks is known for two major achievements in his professional life as a bluegrass fiddler: his flawless work on a series of now legendary instrumentals that were recorded in the middle and late 1950s while he was a member of Bill Monroe’s Blue Grass Boys and for his near quarter-century tenure with country/bluegrass headliner Ricky Skaggs and the band Kentucky Thunder. When Bobby was twelve, the Hicks family moved to Greensboro, North Carolina. Bobby continued to hone his talents on the fiddle. Shortly after the move, he entered a fiddlers’ convention at the Greensboro fairgrounds. In an event billed as the North Carolina State Championship, Bobby placed first by performing “Orange Blossom Special” and “Black Mountain Rag.” His prize was a $50 war bond. He continued to compete in contests over the next several years. By 1953, Bobby found himself in Danville, Virginia, with his first professional job as a musician. 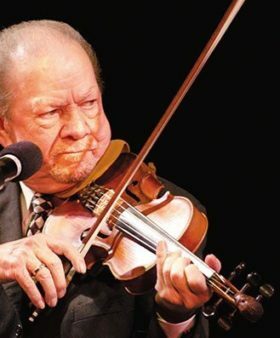 He was in the employ of Jim Eanes, a former member of bands with Roy Hall, Flatt and Scruggs, and Bill Monroe and by now a musician with a degree of local celebrity. It was while working with Eanes that Bobby made two trips to Nashville to appear on recording sessions for Decca Records. The first session consisted of seven songs and was augmented by the talents of budding guitar wizard Chet Atkins. In the early part of 1954, Bobby hooked up with another Danville-based group, Benny Jarrell and the Flint Hill Playboys. Benny is remembered today for having been the son of legendary Mount Airy, North Carolina, fiddler Tommy Jarrell. Bobby’s stay with Benny was somewhat brief and he soon found himself working in Greensboro with a country band headed by Bob Williams; the group did television work in Greensboro and later relocated to Richmond, Virginia. It was while working with Williams that Bobby received a call from Carlton Haney, a North Carolina impresario who later gained fame for birthing the bluegrass festival movement. At the time Haney reached out to Bobby, he was doing some booking for Bill Monroe and needed a fill-in bass player for shows that Monroe was doing in North Carolina, the last of which was at a theatre in Burlington. At the conclusion of two week’s work, Monroe asked Hicks if he would like to relocate to Nashville as a full-time member of the Blue Grass Boys. A phone call to his parents secured their blessings and also requested them to bring a suitcase full of clothes to the now itinerant fiddler. In short order, Bobby found himself in Monroe’s stretch Cadillac bound for Music City. As 1959 was winding down, it was economics that led to Bobby’s departure from the Blue Grass Boys; it was lean times for bluegrass and the pay just wasn’t there with which to support himself. Pursuing his increasing interest in western swing, Bobby briefly moved to Oelwein, Iowa, for a job fiddling in a night club, Then it was back to Nashville to work with Opry star Porter Wagoner, where he stayed for several years, only to find that the pay wasn’t much better with the Wagonmasters. Moving to Billings, Montana, Hicks put together his own four-piece dance band. This foray was short-lived, and his next stop was Las Vegas, Nevada, where he landed with $2.00 in his pocket. A chance visit to the Golden Nugget nightclub put him in direct contact with Judy Lynn, a former Miss Idaho who was then fronting a country music show on the Vegas strip. As luck would have it, she was in need of a fiddle player and he spent the next seven years—from 1963 to 1970—with her in that capacity. He also served as the musical arranger for her nine-piece band. During the early 1970s, Bobby had his own Vegas act. He occasionally found himself back East, where he was able to participate in several of Carlton Haney’s festivals in Camp Springs, North Carolina. The failing health of his mother necessitated his move back to Greensboro. Once back in North Carolina, he hooked up with several local bands and began teaching fiddle, guitar, banjo, and mandolin. It wasn’t long before he had a steady flow of fifty to sixty students. Coupled with this was an increasing stream of session work in which he found himself adding his talents to albums by Doyle Lawson, the McPeak Brothers, Jerry Stuart, the duo of Ted Lundy and Bob Paisley, and the Shenandoah Cut-Ups. He also found time to work on a half-bluegrass and half-western swing solo project: Texas Crapshooter, and a duet album with Kenny Baker: Darkness on the Delta. In 1981, Bobby was approaching fifty and might have been thinking of slowing down. Instead, it turned out to be a pivotal year for him. On May 21, he was hired by Ricky Skaggs, who was just then about to explode on the country music scene. Bobby spent the next twenty-two years with Skaggs, appearing on all of his top-selling chart records and accompanying his much heralded return to bluegrass in the middle 1990s. It was also in 1981 that the first release by the Bluegrass Album Band appeared on the market. As the name implies, it was a bluegrass super group that included luminaries such as Tony Rice, J. D. Crowe, Doyle Lawson, Todd Phillips, and, featured on fiddle, Bobby Hicks. The band gave stellar readings to a choice selection of songs that were originally recorded by bluegrass music’s first generation of pickers in the late 1940s and into the 1950s. Bobby appeared on five of the six albums in a series that took the bluegrass world by storm. Over the years, Bobby had been under-recorded as a solo artist. This situation was remedied with the 1997 release of Fiddle Patch. He tagged it as “pretty traditional” and in keeping with his philosophy as a musician. “It’s very melody oriented; I’ve always tried to stick as close to the melody line of a song as I can.” Fiddle Patch was named Instrumental Album of the Year by members of the International Bluegrass Music Association. Beginning in 2015, Bobby’s latest musical endeavor finds him partnered with Asheville, North Carolina, musician Mark Kuykendall. The duo shares co-billing of a group they call, appropriately enough, Asheville. Two recent album releases showcase a supreme fiddler, still at the top of his game as he enters his seventh decade of performing. There were three fiddles in the Judy Lynn band; she loved that violin-section sound. That’s when I really gout out of the first position and began exploring the neck of the fiddle. Quoted by Douglas B. Green in liner notes to Texas Crapshooter, County Records, 1978. Quoted by Traci Todd in “A Conversation With Bobby Hicks,” Bluegrass Unlimited, March 1998.